Today is gray and rainy. I am happy I was “on assignment” in the nature reserve yesterday when it was hot, windy and just very cloudy. I half expected to see the osprey nestling standing on the edge of the nest ready to spread his wings so that a wind gust would take him up in the air. But he was not quite “there” yet. 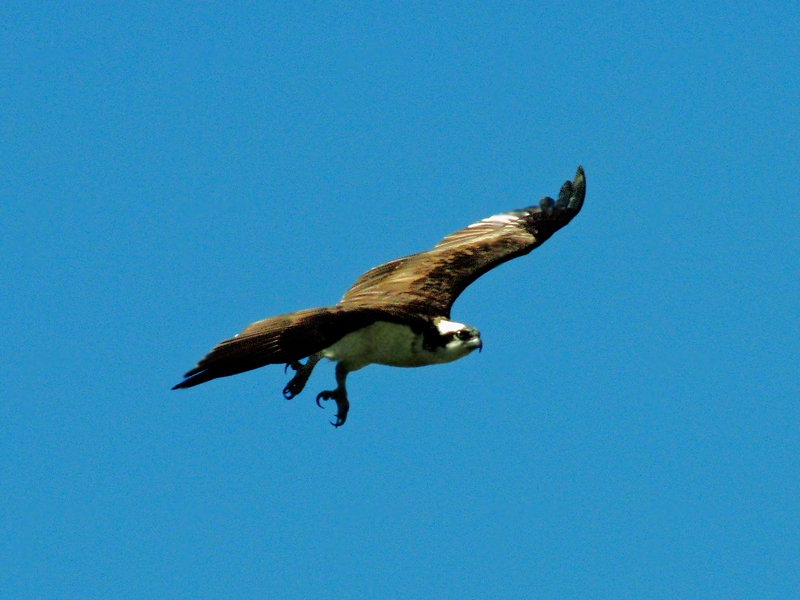 When I approached their nest, I saw the papa osprey flying out for a fishing trip again. The mama osprey and the youngster soon discovered that I was approaching. Both were peering out in my direction. That’s when I saw that the nestling had grown a lot from last week! He was almost two-thirds of the size of his mom. 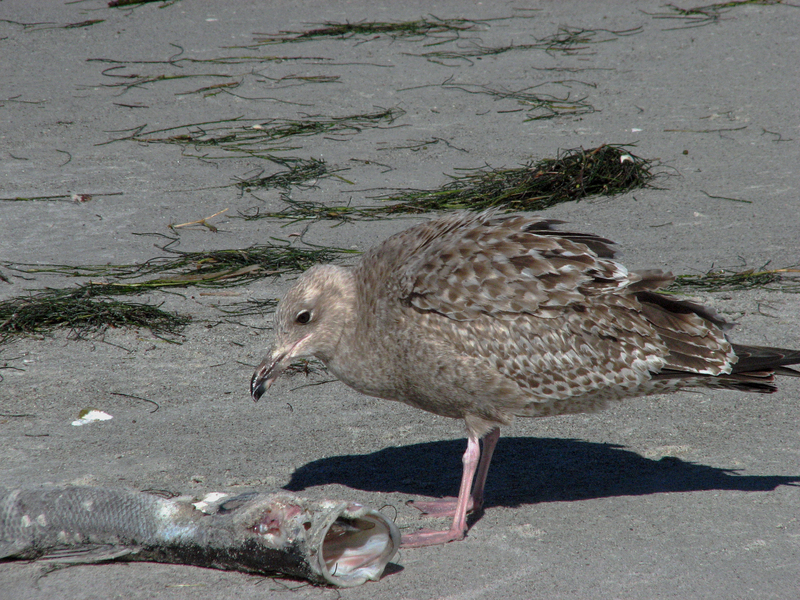 And he was no longer been fed by the mama osprey. He had graduated to solid food! His head was bobbing up and down as he was happily eating from the fish that papa osprey had brought in a little earlier. In this weekend edition I’d like to introduce to you our next door neighbor, the Great Blue Heron. 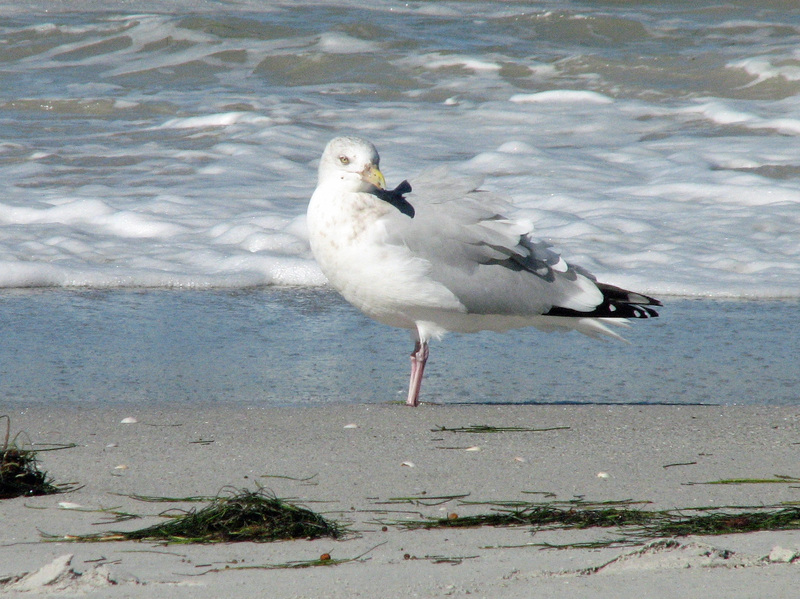 He calls our beach and the nature reserve home. Like we do. 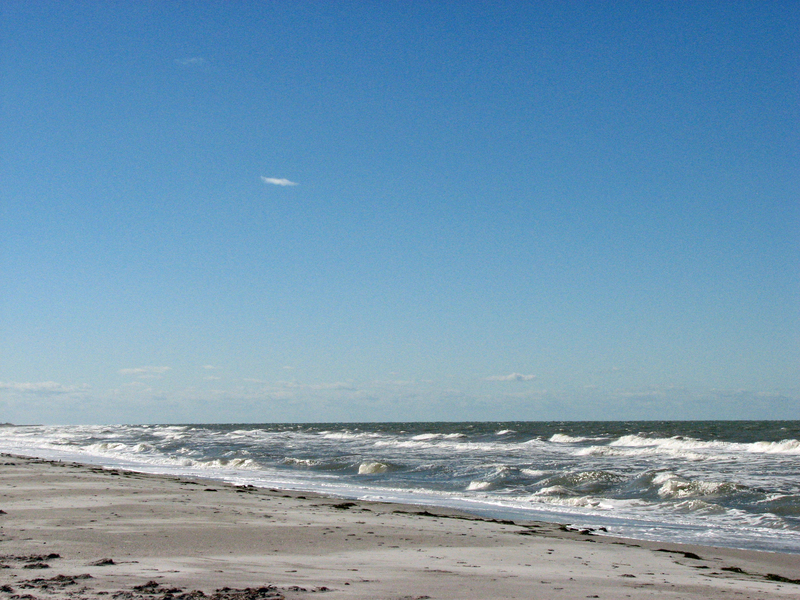 When he’s not at work – fishing in the marsh, he likes to go to the beach. Like we do. He usually checks out the scene from the rocks at the end of the reserve. His preferred pastime is to watch people fishing. Sometimes he even volunteers to guard the fish bucket. And he doesn’t mind company. Provided it’s of the right kind. 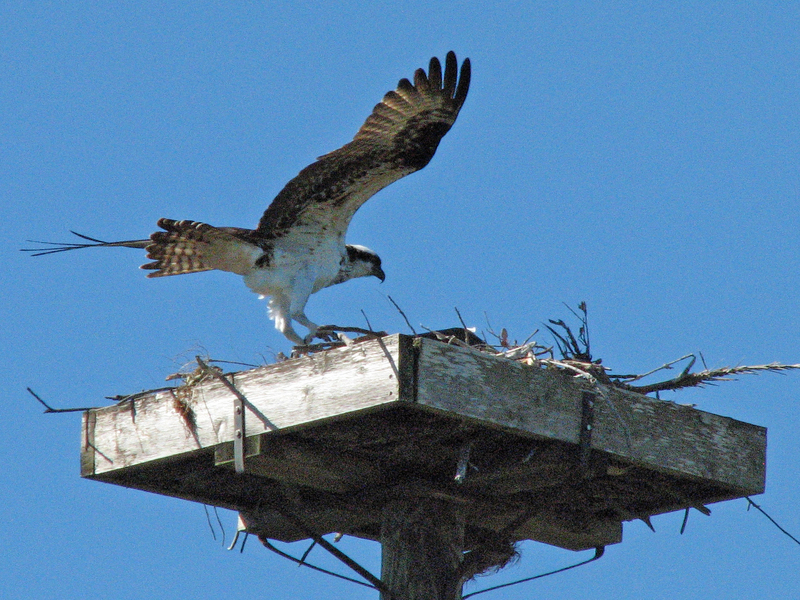 I also have to update you on the situation regarding other important residents, namely the osprey family. I now know for sure that the couple has one offspring, not two. He is growing fast and seems to be hungry all the time. 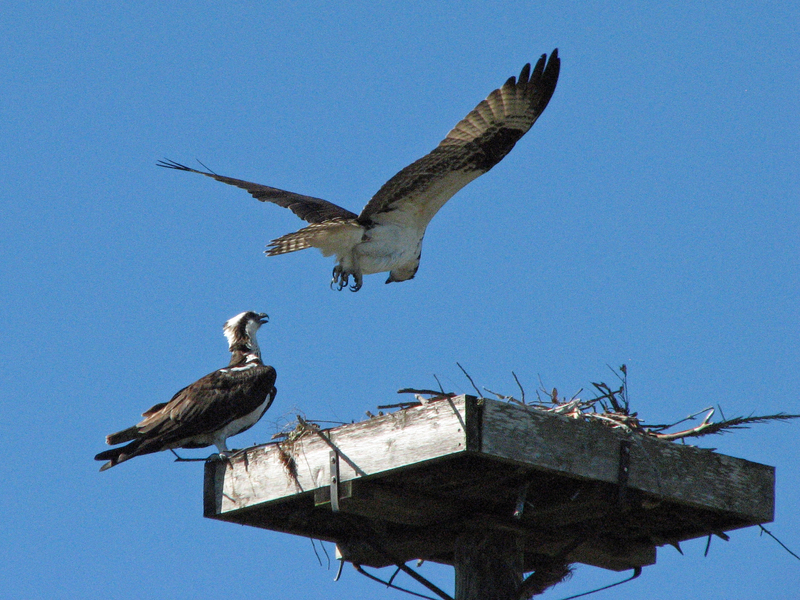 The papa osprey is away on fishing trips most of the time and the mama osprey seems to be responsible for grooming and feeding the nestling. Thanks mom! The fish is delicious! Sometimes I hear her talking in loud voice to the little one. School starts early! I witnessed such a teaching session earlier this week. See, I’m flexing my wings! At the end of the session the youngster flexed his wings…probably dreaming of the wind carrying him out of the nest. One of these days he’ll be lucky. I’ll try to keep an eye on him and report on any new developments. That’s right! 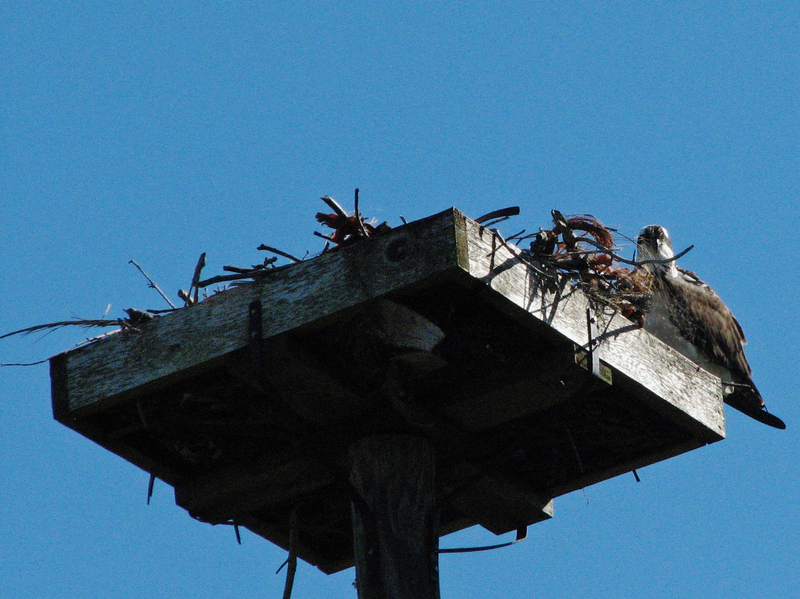 Those of you who have followed my adventures in the nearby nature reserve will remember that about a month ago I witnessed a drama in the resident osprey family. I then thought that the female was laying on the eggs – and I was right! This afternoon I went there again and saw at least one nestling, maybe two. A brown feathered nesting, almost half of the size of the mother lifted his (or her) head when I approached their nest pole. And there might have been another youngster on the other side of the nest. I was too slow with the camera so I can’t be sure. 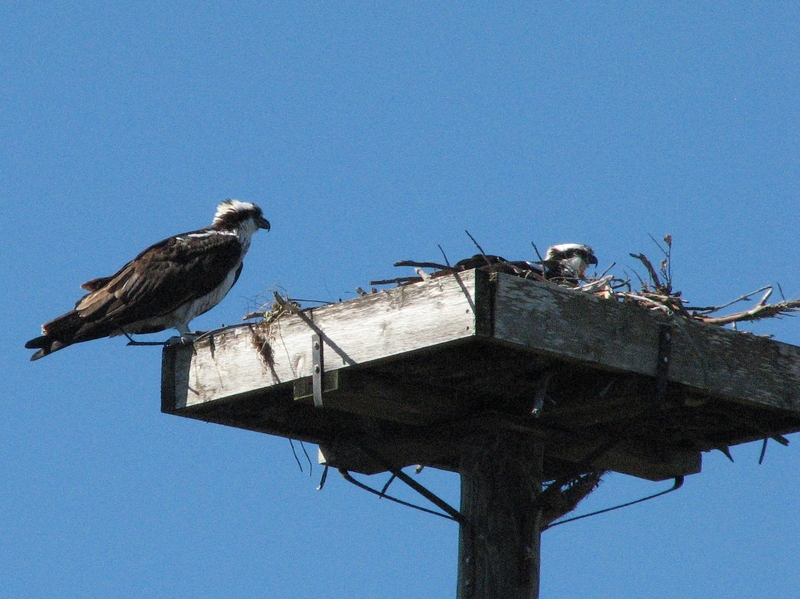 Mama Osprey with a nestling…or two? The nestling I saw clearly was already flexing his wings. That means he’ll fly in 10-15 days! If I am lucky enough to catch on camera some of the practice sessions, where the parents apparently drop fish in the water for the youngster to catch it, I’ll be sure to share those pictures with you. I’m keeping my fingers crossed. I have an alarm event to report. I witnessed it all yesterday on my walk in the nature reserve. 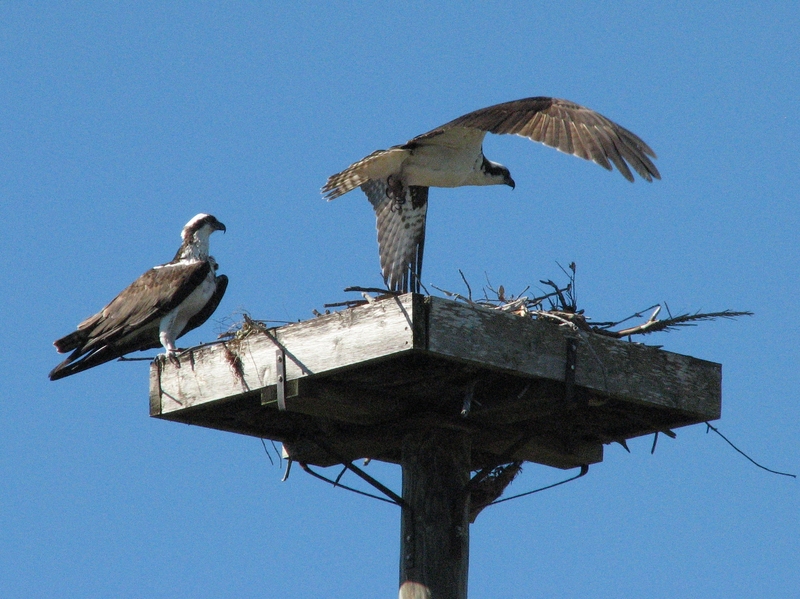 My regular readers remember the resident osprey family, right? So after making my rounds in the park marveling at the clear signs of spring, like the tiny light green leaves on some of the trees, I wanted to end my walk by greeting the osprey family. I was curious to see if the nest would be ready and if the female bird would already sit on the eggs. From the distance the nest looked empty. I hoped that was good news. I also noticed that it was well-built. Nothing moved around and nothing fell down despite the strong winds that had already thrown a few palm branches on my path. After I walked around the marsh and stood up on a bench nicely camouflaged under a tree, I could see her sitting in the middle of the nest. Her head would pop up to check the surroundings every so often. She was there, happily sitting on her eggs! Her hubby had probably gone to fetch some fish for lunch. All was good. I was just about to leave my observation post when I heard her high-pitched alarm. You can see her here sounding the alarm while looking away from me towards the left side of the marsh where nobody usually walks. I looked down too and saw two people with two huge dogs approaching on the grassy strip. Her alarm sound intensified for a few seconds. Suddenly she flew off – towards the “intruders”. 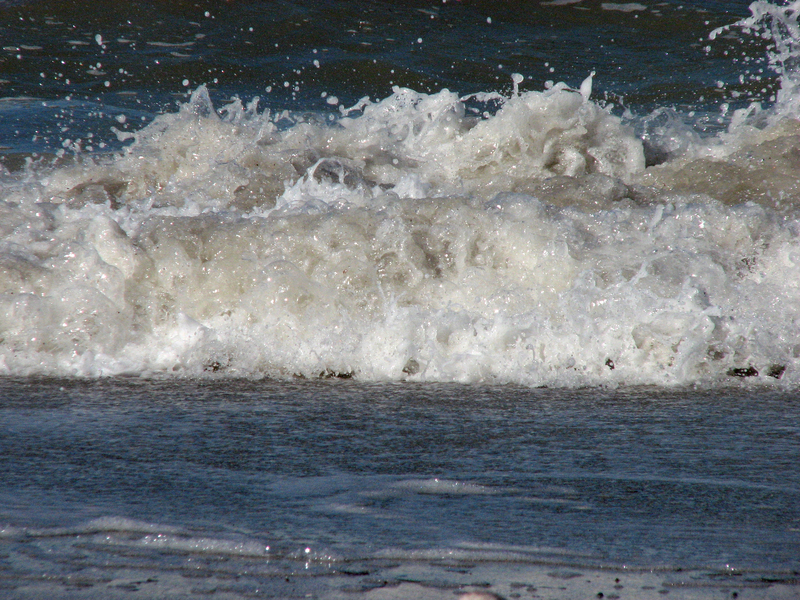 In that moment I saw her hubby approaching like a fighter jet from the bay-side of the reserve. He had heard her cries and was coming to support her! He flew straight into the nest. To check on the eggs, I assumed. He then checked around quickly to scan the situation. No danger from anywhere in the air. He waited there for a few seconds, until the mother-to-be returned to the nest. He then flew off and patrolled around the nest platform in an aggressive manner. He came down towards the people and the dogs a few times. Like here when the dogs were just passing the spot where I stood under the tree. The “intruders” hurried away! The father-to-be circled the nest a few more times. He looked straight down at me and apparently decided I did not pose a danger. He then returned to her in the nest. I thought he was looking at her to ensure everything was alright, while she was looking down in the direction behind me where the dogs had gone. I remained silently under my tree observing the harmony return to the nest. The female was soon feeling safe and returned to sit on the eggs, but the male kept an eye on me from the edge of their home. He had decided to interrupt his fishing trip until everything was absolutely safe. So I said my goodbyes. I thought their collaboration in protecting the offspring was exemplary. And the speed with which the hubby came to her side was admirable. An alarm call responded to in less than a minute! True love. Have a wonderful week filled with collaboration and love.